Simon & Schuster, 9781476734491, 352pp. That’s enough family members to fill Madison Square Garden four times over. Who are these people, A.J. wondered, and how do I find them? So began Jacobs’s three-year adventure to help build the biggest family tree in history. Jacobs’s journey would take him to all seven continents. He drank beer with a US president, found himself singing with the Mormon Tabernacle Choir, and unearthed genetic links to Hollywood actresses and real-life scoundrels. After all, we can choose our friends, but not our family. “Whether he’s posing as a celebrity, outsourcing his chores, or adhering strictly to the Bible, we love reading about the wacky lifestyle experiments of author A.J. Jacobs” (Entertainment Weekly). 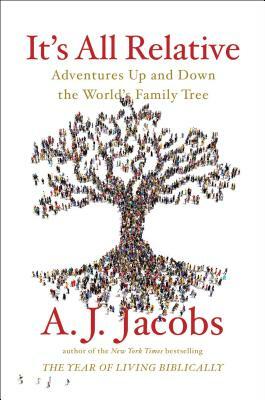 Now Jacobs upends, in ways both meaningful and hilarious, our understanding of genetics and genealogy, tradition and tribalism, identity and connection. It’s All Relative is a fascinating look at the bonds that connect us all. A.J. Jacobs is the author of Thanks a Thousand, It’s All Relative, Drop Dead Healthy, and the New York Times bestsellers The Know-It-All, The Year of Living Biblically, and My Life as an Experiment. He is a contributor to NPR, and has written for The New York Times, The Washington Post, and Entertainment Weekly. He lives in New York City with his wife and kids. Visit him at AJJacobs.com and follow him on Twitter @ajjacobs. “In his latest adventure book, author and experimentalist A.J. Jacobs enthusiastically shares in the human quest for self-knowledge that drives so many of us around the world to search for – and find – our roots. The astonishing discoveries he makes not only reveal the compelling possibilities of genealogical and genetic research; they remind us of the common bonds that unite us as a single global family. As Jacobs’s (however distant) cousin, I admit I may be biased in singing his praises, but as It’s All Relative proves, who isn’t?”—Henry Louis Gates, Jr.
“A hilarious read from beginning to end.”—Adam Grant, New York Times bestselling author of Give and Take, Originals, and Option B with Sheryl Sandberg.